Harmony Haus is a startup idea that emerged out of a 24-hour Eco-Hackathon hosted by Solve.Earth on the topic of fast fashion. Harmony Haus was a eco-startup idea that emerged out of a 24-hour Eco-Hackathon hosted by Solve.Earth on the topic of fast fashion & sustainability. This project was a collaboration with Lavinia Mustapha (fashion & textile designer) Magda Tritto (graphic designer), and Cammy Sha (service designer). The startup, a textile design studio, aims to upcycle pre-consumer textile waste from mills and scraps from fashion houses to create new limited premium fabrics for designers to buy and use. < ^ Samples created by Lavinia Mustapha using textile scraps from RCA textile and fashion department. It is estimated that 60 to 80 billion square meters of pre consumer textiles are waster per year due to manufacturing defects which result whole rolls of fabric to be discarded. While textile mills try to wholesale defected rolls to third world countries, they are often discarded and burned away in landfills. As new designers, we should do what we love, but it is also our responsibility to make sure we do not contribute to more waste in the fast fashion industry. Harmony Haus integrates itself in parallel with the existing industry flow operating as an alternative waste management solution for textile mills and a textile design studio for fashion houses. We strive to acquire unsold or damaged fabrics from textile mills for free or at a wholesale cost, upscale them to create new premium fabrics for designer use not limited to fashion houses but also interior and furniture designers. While we see a future of integrating this practice into textile mills, the skillset and equipment needed to upscale fabrics are different. In recent years we have seen large fashion corporations such as Stella McCartney, G Star Raw, Vivienne Westwood, and Christopher Raeburn make a commitment to a sustainable practices. More so, companies like Nuno Textiles, Bethany Williams and Christy dawn have emerged with the goal to upcycle pre-consumer textiles and source out deadstock fabrics on an industry level. Harmony Haus preserve aesthetics while addressing sustainability by up-cycling variety of textile waste into new original premium fabrics through the process of layering, patching, felting, embroidering. 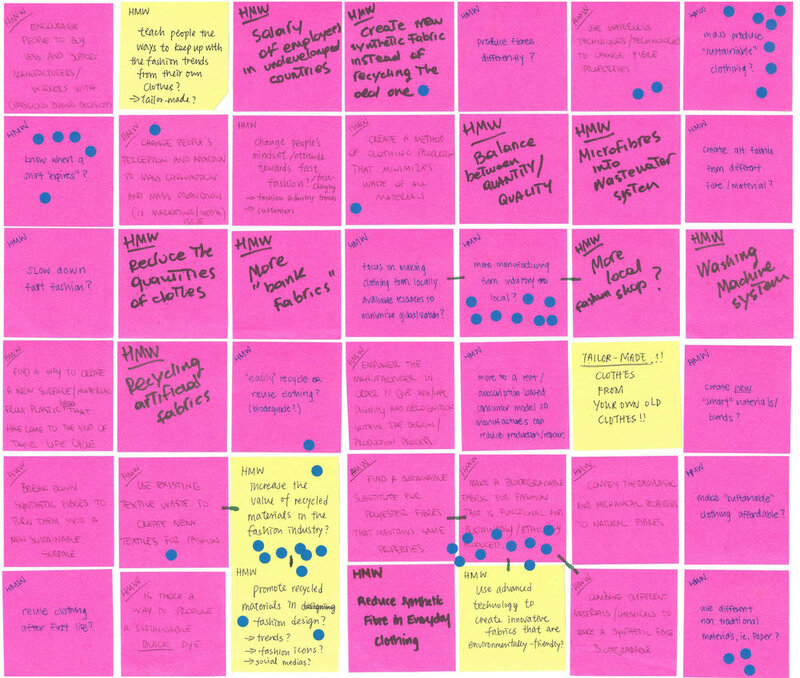 As a group we utilized a democratic ideation process to generate initial fields of interest . Our initial interest group include How might we make a biodegradable fabric with the use of advanced technology, know when a shirt “expires”?, mass produce sustainable clothing, and increase the value of recycled materials in the fashion industry.